Water testing results are now available online. Customers can review our water testing results throughout the year rather than waiting for the annual water quality report to be mailed. Please contact the Water Department if you have any questions. After several weeks of performance testing the new treatment plant is ready to go into service. MassDEP granted approval this evening. Hydrant flushing starts on October 8th. Schedule available at https://t.co/uha6HutQyu. Project will take approximately 5 weeks to complete. Please visit the Unibank site to pay your water bill. Our water system uses groundwater wells to supply water for our customers. 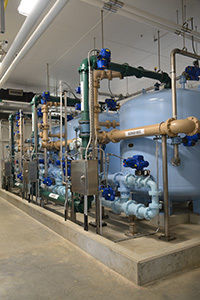 The water undergoes a variety of treatment processes to improve its quality in order to met drinking water regulations. The first process is natural filtration through the sand and gravel deposits near the wells. As water travels from the land surface towards the wells, the naturally occuring sand and gravel deposits fitler out many contaminants including coliform bacteria, vegetative debris, and other contaminants that are commonly found on the surface of the ground or in surface water bodies. Sodium Hypochlorite Pre-treatment: Chlorine is added to the water as it arrives in the plant to start the disinfection of the water. Chlorine is also an essential component of greensand filtration becuase it is the primary oxidant used to oxidize manganese. The pre-filtered water typically has a free chlorine residual of around 075 milligrams/L (mg/L). Pre-treatment pH Adjustment: The pH or acidity of the water is reduced prior to filtration. The pH of the raw water, normally around 6.5-6.5, is raised to 6.9 using potassium hydroxide. Potassium Permanganate Pre-treatment: We have the option of using potassium permanganate to oxidize the manganese but it is not in use at this time. Greensand Filtration: The water is passed through filter vessels with a layered media including anthracite, Greensand Plus and gravel. The Greensand Plus traps any manganese in particulate or soluble form and removes it from the water. This step also removes iron but we typically have very little to no iron in the water. Aeration: The water is pumped through an aerator which strips out carbon dioxide to reduce the amount of dissolved inorganic carbon and further increase the pH of the water from 6.9 to 7.5. This step improves corrosion control and raises the pH without chemical addition. Fluoridation: Once out of the aerator, fluoride is added to the water to maintain 0.7 mg/L of fluoride. This step is intended to prevent tooth decay. Pre-clearwell Disinfection: We have the option of adding chlorine prior before the water enters the clearwell. Clearwell: The water enters a baffled clearwell arranngement that provides additional contact time for the disinfection process. This allows us to produce water that has a lower and more stable chlorine residual when it leaves the plant. Post-treatment pH adjustment: We have the option of increasing the pH of the water just before it leaves the plant. This is not currently used but will be required when the aerator is undergoing maintanence. Phosphate: A ortho/poly-phosphate blend is added to the water as it leaves the plant. This formulation was used to sequester manganese but also has corrosion control benefits.